Are you podcasting yet? If not, it’s high time you thought about starting. Podcasting is nothing new — remember when we all had iPods instead of iPhones? But today, this audio content format is more popular than ever. It’s basically the modern version of talk radio, except that it’s on demand. Tons of popular content publishers — especially B2C brands — are creating regular podcasts these days. You might even follow some of them, like the Smart Passive Income podcast or Neil Patel’s Marketing School. As a whole, the total podcast listener base is steadily growing. Plus, people have a strong tendency to “binge listen,” so to speak. Once they’ve heard one, there’s a high likelihood they’ll check out the rest of your episodes. It’s a great way to reach your audience, and all you really need is a decent microphone. It’s accessible yet powerful, making it an ideal medium for budget-conscious solopreneurs. Check out these stats and facts from Social Media Examiner. Something that podcasters have been asking about for years from the podcast host. According to Adopter Media, Apple hosts 70% of podcasts and up until now, they’ve largely ignored these requests, possibly because they take the privacy of their users seriously. Granted, the data provided will be aggregated (and anonymous) performance data. But it’s better than what had (or hadn’t) been available. Podcasters were only able to see when a user downloaded an individual episode; you never knew if the listener finished it or if they dropped out a few minutes into it. 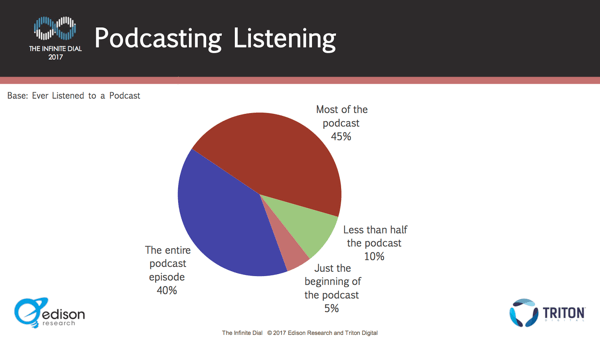 In fact, Edison Research learned that 45% of people only listened to “most” of the podcast. Content creators were flying blind. Social media platforms like Facebook and Twitter gave marketers detailed usage information; therefore, they could provide highly targeted content. Podcasters basically put something out and hoped for the best. Most listeners hang around for the length of episodes. Now that podcasters can see how listeners are interacting with their episodes, they can start testing out different kinds of podcast content… something that marketers and advertisers have been able to do for years on other social media platforms. It’s no secret that once you start providing content that listeners want and enjoy, they’re more likely to interact with it in the form of continued downloads and even sharing. Once the listeners start flocking in, so will the advertisers. This development can be a real game-changer in the podcasting world. PLUS the addition of analytics means that you can’t ignore podcasting anymore. If you’ve avoided it, it is officially time to reconsider. You can read more about using podcasting as part of your marketing strategy over at Social Media Examiner.